It’s been more than a decade since the last “Barbershop” film hit theatres. However, the iconic franchise didn’t just stay dead as Calvin’s Barbershop is open for business again this year with a mix of familiar and new faces. Titled “Barbershop: The Next Cut”, the 3rd film sees Ice Cube returning to the franchise as Calvin, who still runs his eponymous barbershop in the South Side of Chicago. But as the title suggests, there’s a new generation joining Calvin and his longtime crew. The shop has undergone some major changes as the once male-dominated store is now co-ed. Despite the good times and camaraderie within the shop, the neighbourhood outside the store has taken a turn for the worse. Calvin and his crew must come together to not only save the shop, but also their neighborhood. Calvin’s crew includes those played by Common, Regina Hall, Anthony Anderson, Lamorne Morris, Eve, and Nicki Minaj. Cedric the Entertainer, who starred in both the original film and 2004’s “Barbershop 2: Back in Business”, also returned to “Barbershop: The Next Cut” to star alongside Cube. The film also stars Sean Patrick Thomas, Jaszmine Lewis, and JB Smoove. Veteran filmmaker Malcolm D. Lee (of “The Best Man” fame) is directing the film based on a script written by Kenya Barris and Tracy Oliver. 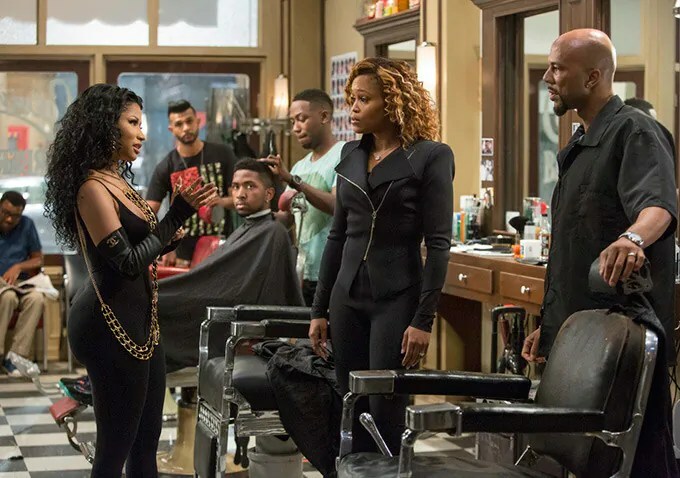 Cube is producing it alongside Matt Alvarez, Bob Teitel and George Tillman Jr.
“Barbershop: The Next Cut” is slated for release on 15th April 2016. For more information, visit the movie’s official website and Facebook page.